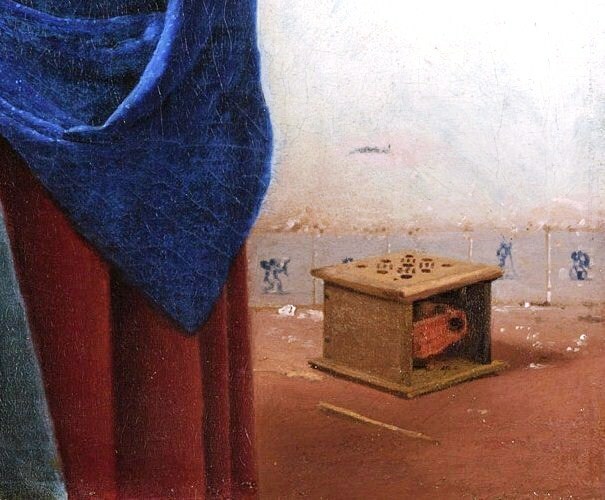 However, there is one thing I noticed about Vermeer that seems particularly interesting. The background of his interiors borrows from the main color in the garment people are wearing. This process creates a degree of continuity to his paintings. 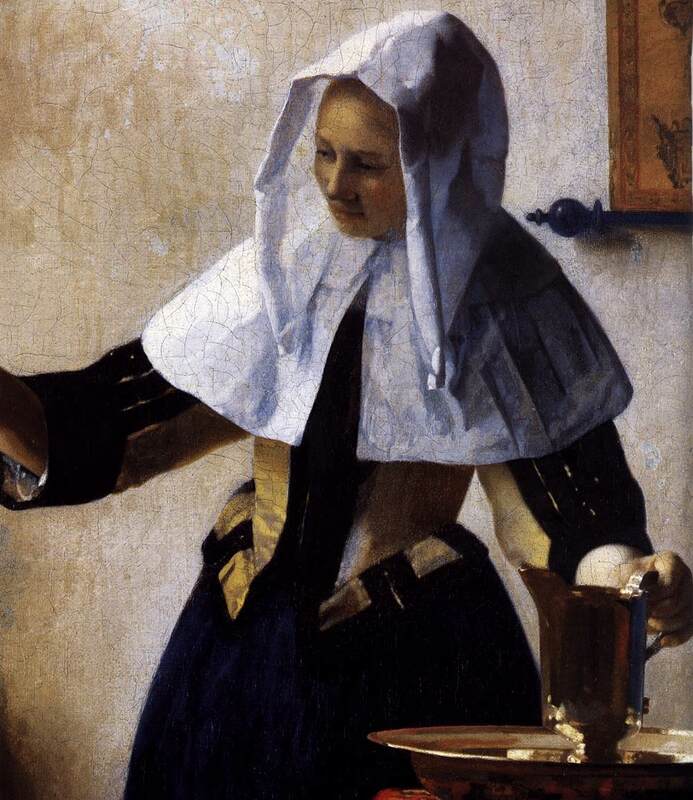 However, here, the white hat and cape are major factors in the manner Vermeer shapes the canvas and gives the whole painting the pale or bright area it requires. In this painting the red of the dress colors some of the floor tiles. Yet, the white wall is suddenly blue. 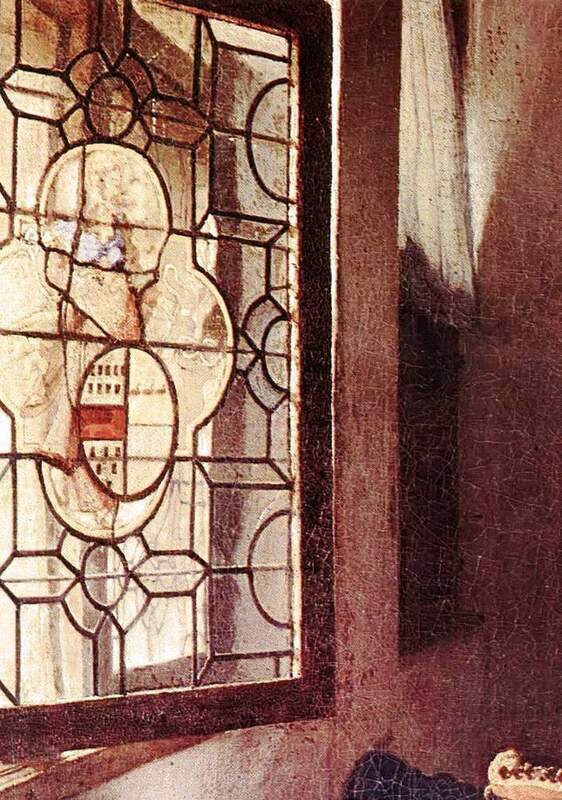 The way Vermeer allows the light to touch here and there brightens up the painting considerably. This painting is nearly monochromatic, but that is because it is a detail. The detail looks like a gold and black painting. The darkened wall makes the girl’s face stand out. This is a common technique, but would that more of us could do this so well. When I first introduced to “genre” painting, the word “genre” intrigued me and it still does. Theoretically, “genre” paintings depict people going about their everyday activity. Such a definition suggests a very broad range of paintings. For instance Hendrick Avercamp (January 27, 1585 (bapt.) – May 15, 1634 (buried)), who painted winter lanscapes, is also a “genre” artist in as much as his paintings show people going about their daily chores or skating, or playing golf on ice. However, we can narrow down the field to people going about their daily tasks indoors and in courtyards rather than outdoors, which leads us back to the Dutch Golden Age and, in particular, to the art of Johannes Vermeer (1632, Delft – December 1675, Delft). [i] Vermeer’s “Girl with the Pearl Earring,” a 1665 portrait, is now a favorite. Yet, Vermeer, a Dutch Golden Age painter, who lived in Delft, specialized in everyday interior scenes and his paintings of domestic scenes are now considered the standard reference. Yet within the narrower field of interiors, there is diversity. 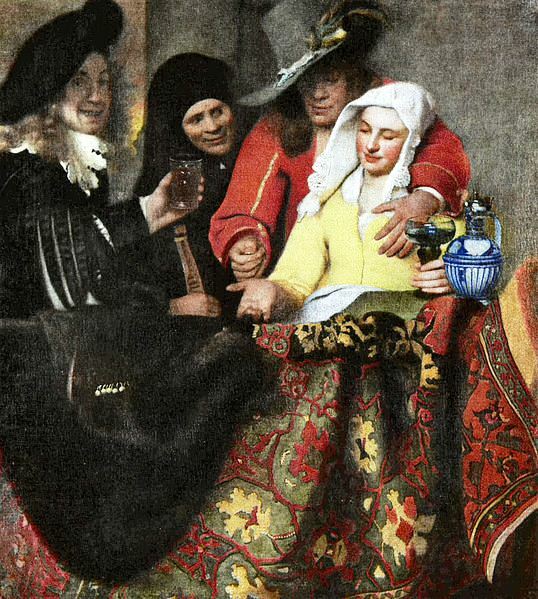 One of Vermeer’s better-known paintings is “The Procuress,” c. 1656, a brothel scene in which Vermeer himself is probably portrayed (first person to the left). “Genre” works may also depict merrymakers in taverns. 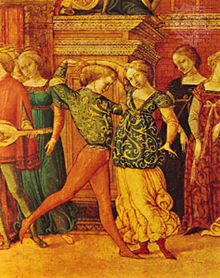 The “Procuress” is a legitimate genre painting, as are the paintings of drunken deer drinkers. But such paintings may not be purchased by a bourgeois housewife who would prefer to look at an interior resembling her own or one she would like to live in, which is not an insignificant factor. “The Procuress” is a relatively early work. In fact, by 1656, Vermeer was beginning to paint the luminous interiors, such as the ones featured below, all of which may have been painted in the same two rooms of Vermeer’s well-to-do’s mother-in-law’s house in Oude (Delft). With respect to these somewhat intimiste paintings, it may be helpful to read a few sentences from the Encyclopædia Britannica‘s entry on Vermeer. 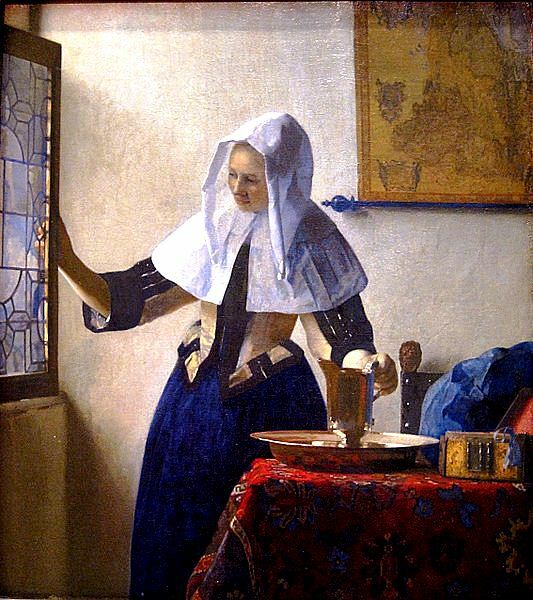 Chief characteristics of Vermeer’s interiors are black and white flooring leading to a vanishing point, leaded and at times colored windows on the left side of the canvas, heavy rugs on tables, musical instruments, virginals in particular, jugs, and, in “The Milk Maid,” a baseboard made of blue Delft tiles (see below). 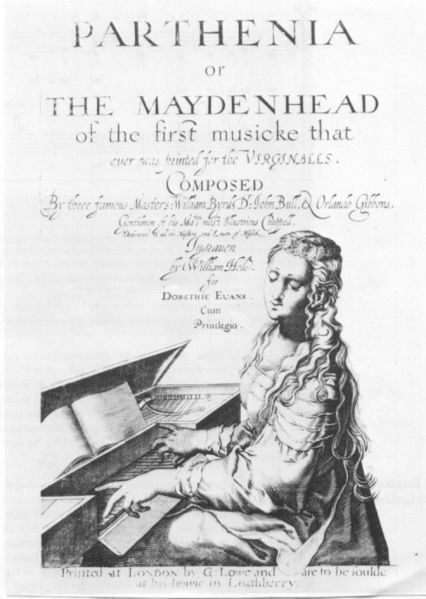 In his “Lady at a Virginal with a Gentleman,” you may have noticed that the mirror above the virginal echoes the floor. 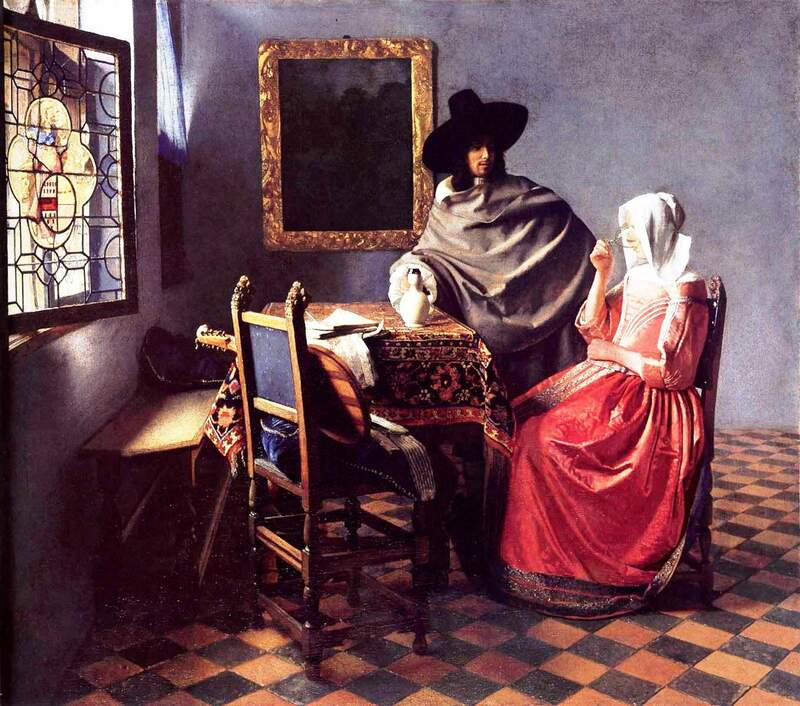 Vermeer was influenced by the Utrecht Carravagists (see chiaroscuro) who enjoyed paintings-within-paintings. Vermeer’s interiors are clean and his characters, neatly dressed. These are rooms that suggest a degree of comfort and are a pleasure to look at as well as a collector’s dream. Vermeer, a Delft artist, sold at least 21 of his paintings to Jacob Dissius, a Delft collector. 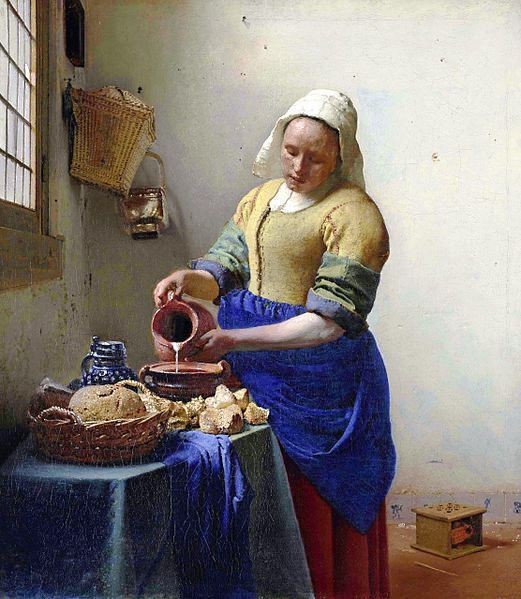 Pieter van Ruijven, a baker, also bought two paintings by Vermeer. As a result, Vermeer was not well-known outside Delft and, given that he worked slowly, there are only about 34 to 36 paintings indisputably attributed to him. He was, after all, the busy father of eleven children and an art-dealer, as was his father. From his father, he had also inherited an inn. 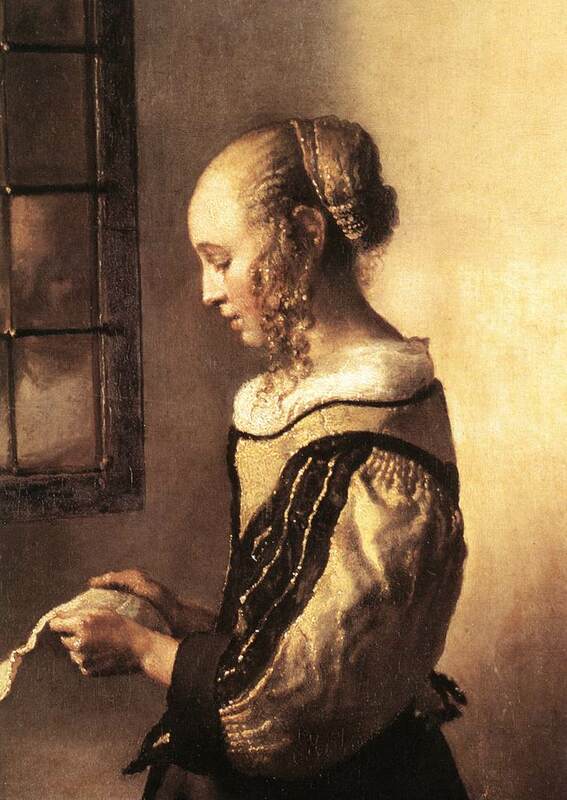 Although Vermeer seems to have stayed in Delft most of his life, he did not work in isolation. He was a member of The Guild of Saint Luke, which he joined on 29 December 1653. He was elected head of the Guild in 1662, and was re-elected to the same position in 1663, 1670, and 1671, which is a tribute to the exceptional quality of his paitings and esteem on the part of Dwelft painters. He was influenced by Carel Fabritius, Leonaert Bramer, Dirck van Baburen (c. 1595 – 21 February 1624) and Gerrit von Honthorst, an Utrecht Caravaggist. He may have tutored Pieter de Hooch and Nicolaes Maes, but these artists competed with him. Until the invasion of the Dutch Republic by French troops, in 1672, the Dutch Republic had been a prosperous nation. But it was suddenly severely impoverished. 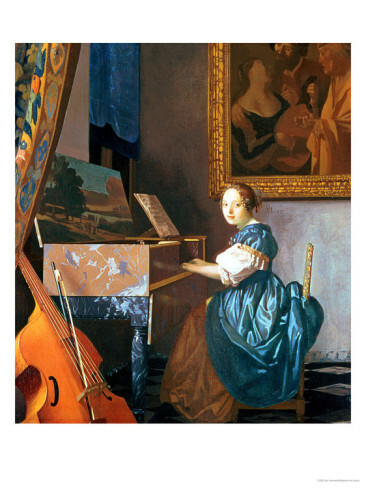 During five years or so, members of the middle-class could not purchase art and, by extension, artists could not sell their art, not to mention that Vermeer worked slowly and used expensive pigments (lapis lazuli, ultramarine, cornflower blue, etc). When he died, in 1675, aged 43, probably of meningitis or encephalitis, then called “frenzy,” Vermeer left behind eleven children and debts to pay. Furthermore, he would be forgotten until rediscovered in the nineteenth century by Gustav Friedrich Waagen and Théophile Thoré-Bürger. * The box on the floor is a foot-warmer. The baseboard is made of blue Delft tiles. Please click on the picture to enlarge it. So let this be our introduction to “genre” painting. The Vermeer paintings shown above are interiors and it could well be that focussing on life indoors or in courtyards is the chief characteristic of “genre” painting. Furthermore, we had the privilege of seeing some of the most beloved “genre” pieces in European history. I must close. So, at this point, let the paintings speak for themselves. I wish you all my very best.